To celebrate their upcoming desert nuptials, this fun-loving LA couple chose Joshua Tree for their engagement session. Inspired by the enchanted landscapes, stylist Katie Linter of Two Hearts Event Design created a styled engagement session that complemented both the singular beauty of the Coachella Valley and the romantic, playful nature of the couple. Donned in a flowing silk dress with beaded floral applique, our bride-to-be spends the afternoon cuddling with her handsome groom and exploring the desert. 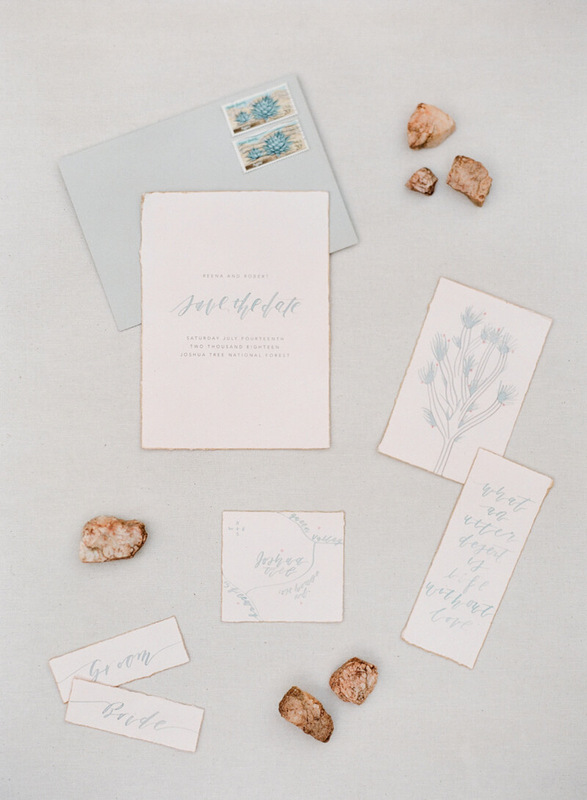 Betlem Calligraphy designed unique save-the-dates complete with a map and custom watercolor Yucca drawing as a nod to Joshua Tree's namesake. Maher Haroun designed organic, understated floral pieces in keeping with the locale. With a pretty palette of greens, corals and pinks, this sun-drenched engagement session is sure to inspire whimsy and delight.